A financial planner is professional that assists individuals and companies with financial planning. Most financial planners obtain official certification in order to establish competency and credibility. Keep reading to learn what financial planners do and how they help their clients. Financial planning involves basic principles of accounting and finances. This includes specific concepts, such as money value and cash flow management, and broader concepts, such as financial statements and economic theories. 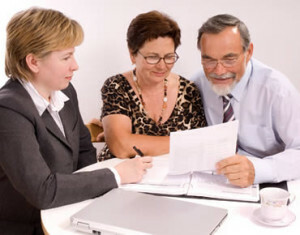 Financial planning also involves professional counseling and communication with clients. Therefore, financial planners must understand common values, attitudes, behaviors and misconceptions regarding money and finances. Financial planners analyze their clients according to contextual variables, such as family status, net worth, income level, life stage and other extenuating circumstances. Financial planning covers different aspects, such as estate, insurance, investment, retirement, employee benefits and financial planning. Risk, liability and cash flow management are also important parts of financial planning. For example, financial planners may work as retirement advisors and assist clients with medicare, social security and tax-advantaged retirement plans. On the other hand, they may help their clients plan to reduce corporate tax liabilities in order to free up cash flows. Financial planners may also help their clients with insurance planning. For example, this might include performing an insurance needs analysis or setting up long-term care insurance. Financial planners also assist with long-term education planning, such as researching financial aid and recommending tax strategies. What are the Six Financial Planning Processes? There are six areas of financial work processes, including establishing client relationships, gathering data, analyzing finances, developing recommendations, implementing goals and monitoring results. During the first two stages, financial planners establishes a professional relationship that defines boundaries, expectations and client goals. The next two processes involve assessing the client’s financial status, developing a customized plan and presenting the information to the client. The final two processes involve implementing the agreed upon recommendations and monitoring the performance. The Certified Financial Planner Board of Standards (CFP Board) is the accreditation organization that provides CFP exams and certification. The CFP Board has four “E” eligibility categories that must be met for certification: education, exam, experience and ethics. Students are not required to have a bachelor’s degree at the time of the exam, but they must obtain one within five years. Students will be tested on over 100 financial topics. However, certain professionals, such as lawyers or Certified Public Accountants (CPAs), can directly take the exam without proof of previous education. Exam candidates must have at least three years of financial planning employment. Finally, exam candidates must agree to the high ethics standards, referred to as the Standards of Professional Conduct. The CFP exam originally was a 10 hour test containing almost 300 questions that took two days to complete. Fortunately, the exam is now computer-based test with 170 questions that takes six hours to complete. The exam includes case studies, financial scenarios and in-depth financial questions. The CFP certification is public proof that the person is competent and knowledgeable. Every two years, CFPs must review their certification through completing at least 30 hours of continuing education credits. Summing up, financial planners provide critical advice and assistants to their clients. A financial planner is a proficient professional that can reduce risks and increase financial stability.